Short and easy solutions for the most common technical issues that new and veteran players might experience. 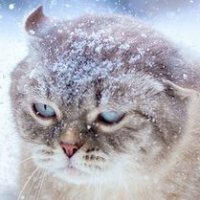 Even if we do already have a longer read and more detailed player constructed technical issues thread players seem to ignore it. 3. 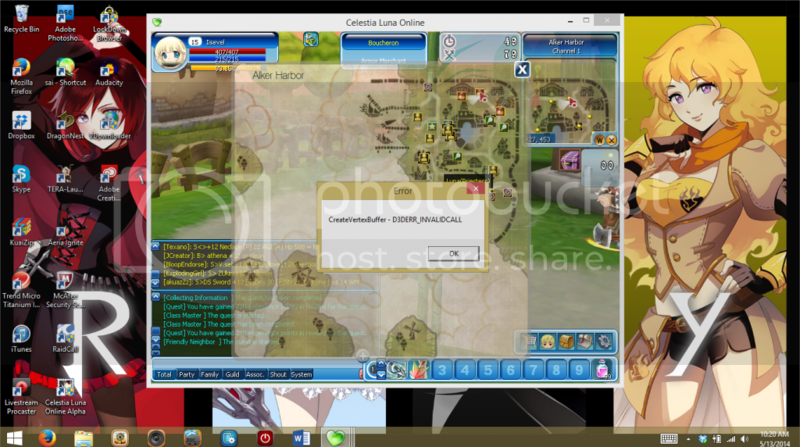 I get an error saying "D3DERR INVALIDCALL" when I run the game and it closes afterwards! This mostly happens when you try to run the game in full screen mode in a resolution that your screen does not support. Try running the game in windowed mode instead. These are the top 3 problems new and veteran players might get, for more detailed information use our search function with keywords related to your problem, all past and current technical problems have already been solved before. "Go to your game folder (ex: C:\Program Files (86x)\Celestia Luna Online Alpha\) and delete the file called "celestiapatch" and run LUNAPatcher.exe"
This will also fix the issue of not seeing pvp map on map move scrolls or being able to sell things for over "4b"
am i the only one who's encountered this? i cant connect to sever can help?? because you must read properly. 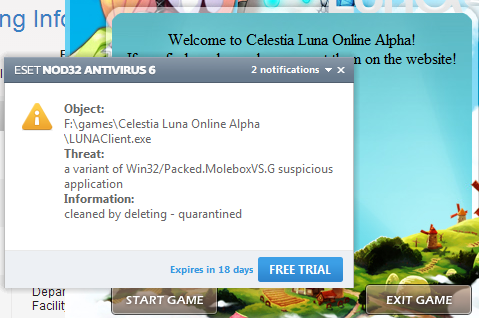 Sounds like you got rid of the wrong file, the file you must delete is called "celestiapatch" not "LUNAPatcher.exe"
I'm having trouble with the "D3DERR INVALIDCALL"
even in window mode, what else can I do to fix it? How often does it happen and is it in a specific situation, ex: talking to a npc, using a skill, etc? is there any topics discusses NSIS Error? thanks. i cant connect to the game,well i can select the server and log in,but nothing appeared when i select my character and click "connect to game"
my brother tried his ID too and its all normal without any problem. Does your character(s) are in Alker Harbor? If yes, Alker Harbor is down now. Did your character are in Alker Harbor? If yes, Alker Harbor is down now. You can teleport your character at celestialuna.com, log in, click teleport, pick the character you want to teleport, choose the place you selected for your character that you've picked, and then click teleport. I am not really a Tech Head so I will make this as short as possible. I was playing with my girlfriend earlier Today and the game was running Fine. We logged off and left, Now she is trying to get on Now but it keeps saying Failed to Communicate with Server Whenever she presses the Icon. As well as the Icon Looks different. My problem is number 1 .. I already add to exception with baidu antivir.. Then it still bug. And now i delet my antivir but still happen.. How can u fix this ?? The login server is acting up, it probably has nothing to do with your antivirus. So what should i do ?? Try to delete celestiapatch in the Celestia Luna folder, and run the game. i try but still same .